And then if they can show me pictures like this one, I’m more inclined to believe it… but it doesn’t mean that it is true in every case of elongated skulls. There are two types of elongated skulls….the ones with three plates like all humans have, and the ones with two plates like no humans have. 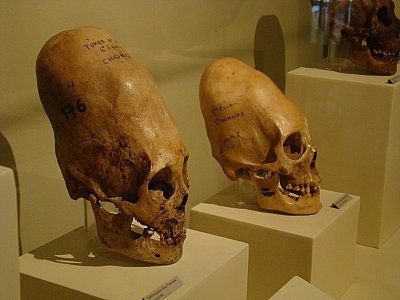 I think the scientists involved with these skulls are trying to make everyone believe that all elongated skulls are from the molding of heads with boards. But it’s possible there is another explanation here. 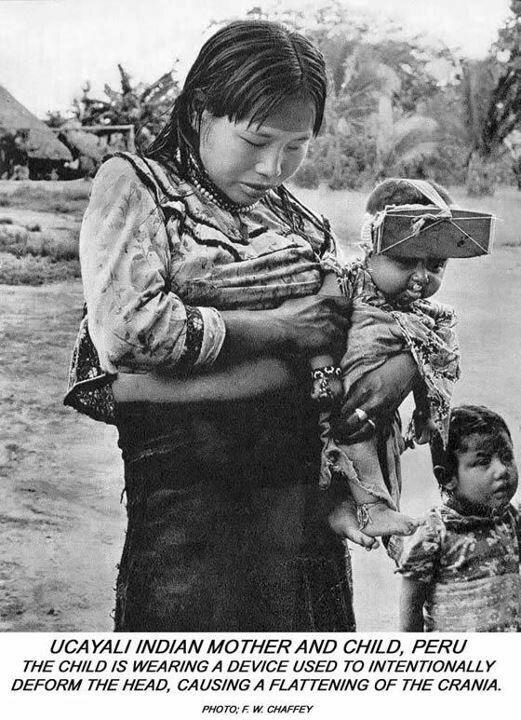 Here’s a photo of a woman who has strapped a board onto the head of her child. I get it. I see that this is a custom and that we could easily say all elongated skulls are developed this way.In some cases, I believe the Mayans DID do this to their kids… but do I believe it explains ALL elongated heads? Nope. Recently I went to the Ancient Mayan display at the Denver Museum of Natural Science. They had an 80 year old lady telling everyone that elongated heads were from strapping on boards to the heads of infants. Now she was most likely a volunteer and there was no way I was going to engage in an argument with her, so I left it alone. But I left with questions. My questions at the museum are this…. 1. The skull had at least a 30% more mass in bone than a regular skull… so if you are shaping the way the skull grows, it wouldn’t grow MORE bone would it? 2. Why is there just 2 cranial plates on this skull instead of the 3 plates all humans have? In my studying of the Nephilim giants, what I am learning goes against the grain of the great evolution machine. Yet I don’t have confidence in mainstream scientists to even consider other possibilities. I think they have been so ingrained and hoodwinked into believing and promoting evolution that when questions like this come up, they either skirt it under a rug or they rationalize it. After all, it couldn’t possibly be something else…because what they believe is surely true. That my friend, is bad science. Here is a great little video from a museum in Peru that shows the differences in the different kinds of skulls. What Museum in the US would ever discuss the possibility of another race of beings involved in the human race. Secularists pushing this theory think they are aliens, Christians think they are “Nephilim (fallen angels)”…maybe they are both right. Another question we should be asking is WHY the Mayan’s put boards on their children’s heads. Who were they trying to emulate? Many ancient cultures speak of their rulers being giants and children of “the gods”. If they regarded Nephilim as children of the Gods and the Nephilim had these large pointed heads, would they be honoring these gods by making their children look this way? Also, the Egyptian rulers were all considered to be “Sons of the gods”…you couldn’t be in the Egyptian dynasty unless you were born of the lineage of the kings. 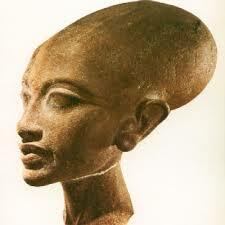 They have statues of elongated heads. If Nephilim children were the beginning of those lineages, it would make sense as to why the people really believed the rulers were truly Gods. I am trying, in my learning to be open to whatever the truth holds. I think we all have vested interests in what we believe, but those interests shouldn’t dictate reality to everyone else. People should be allowed to trust their instincts and experiences. Nothing is wrong with asking questions. People appreciate mysteries because they cause us to evaluate our own lives and spiritual journeys. My journey tells me that Adam and Eve traded the “good” knowledge -where they had logic plus God’s relational insight- for just pure logic (which was the tree of the knowledge of good and evil- because it was knowledge without insight from the One who made it). I think He made creation so complex that as we were to grow in relationship with Him in the garden (and throughout life), He would show us amazing things about the pure science part of it that we’d never catch onto without Him showing us. We, as a race, stepped away from the relationship with God and He withdrew. We were left to learn about science and the earth on our own and be cursed with never really seeing the whole truth because the One who knew it all was left out of the equation. Luckily God planned to redeem us and we can restore that relationship with Him again. We can walk with Him daily and get Godly insight in science and about the natural earth. Most of us just don’t know how to do this these days. That’s why my book Snatchproof is important – to learn how to hear the voice of God!